The Delegation of the European Union in Washington D.C. generously organized a study tour to Brussels this summer from July 9th to 14th, 2011 for 20 faculty advisors whose schools participated in the Euro Challenge 2011 to learn more about the European Union and the euro area. Throughout the trip the teachers had the opportunity to hear from experts on issues ranging for the structure and function of the EU, to current legislation on the table, the current economic situation to US/EU relations. 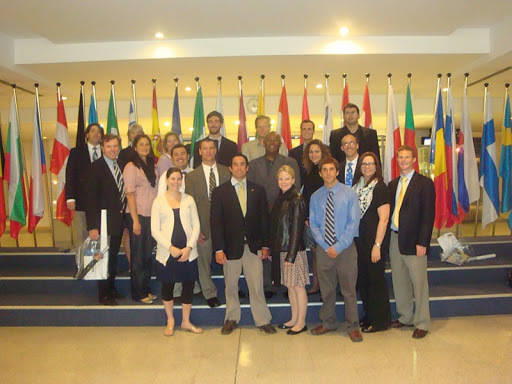 They had the pleasure of visiting the EU External Action Service, the Council of the European Union, the European Commission, The US Mission to the EU and the EU Parliament. ► During summer 2012, another study tour to Brussels will be offered to teachers who will participate in the Euro Challenge Competition 2012.